The horse racing betting calculator app, is a great little app that costs just £0.69 for the ad free version. It will allows you to calculate all bets, help you keep tabs on what you’ve staked, and even calculate your returns. The app has no betting function, so if you want an app to bet on, check out our betting apps guide. The developer is very supportive of its app and rightly so, as it can even arrange complicated bets like and Lucky 15s. Although there are many popular betting calculator apps, they do come with their limitations, but the horse racing betting aims to address these shortcomings. You have to imagine the scenario. You walk into a betting shop planning to stake £50 on several races. You end up with a betting slip on race 1 containing a £25 win on Likely Lad at 2/1 and a £20 win on Definite Prospect, while race 2 is a £2.50 each way on Big Outsider at 30/1. A traditional betting calculator would force you to enter and exit the app several times in order to complete the calculations, especially if you placed two different bets on the same selection. This genius app allows you to have a variety of selections within the same bet. Although the horse race betting calculator app is not one of the free apps available through iTunes, it will save you heaps of time in making your own notes of the bets, stakes, and returns. If you attend a day at the races and place your bets, add them to the app, and the app will do all of the calculations for you. The iPhone screen shots provided on the iTunes preview page highlight that this app is extremely easy to navigate. Simply add your selections and the genius app will list the total stakes and potential returns. If you’re a winner it’ll place ‘won’ beneath the selection. It’s only a basic app so don’t expect too much colour and dashing extras, but this app does exactly what you pay it to do. If you’re dissatisfied with a particular bet there is always an option to delete the bet. 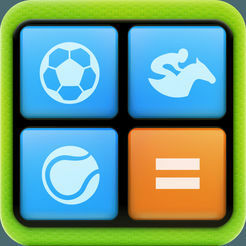 The horse racing betting calculator app allows you to combine decimal and fractional odds. Add the amount of your stake, the odds, the odds type (SP/fractional/decimal), bet type (win or each way), and the place odds (1/2 / 1/3 / 1/4 / 1/5). 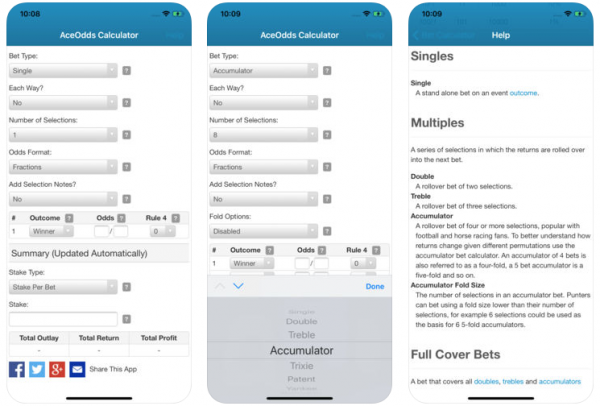 This betting calculator app allows an array of selections, plus you can place more than one bet on a selection..
It’s worthwhile to note that this app does include mild simulated gambling so it’s only suitable for users aged 12 and over. The size of this app is also tiny at only 0.1 MB. Yes, you have to pay for this app but you’re paying for a service that will save you a lot of time. The other free betting calculators do not work in the same way as this app, as you may have to constantly log in and log out to check on several bets within the same selection. If you want to save time on an app that allows you to include all bets while calculating your stakes and returns, you’ll love the horse racing betting calculator app available through iTunes. The app was released in May 2011 and has not yet received an update since this date; however, it’s compatible with any software of iOS 3.2 or older so it’s likely to work on older Apple gadgets. It’s affordable at only £0.69 and a worthwhile app to have if you’re an ardent horse racing fan. Download it onto your device through the iTunes store.